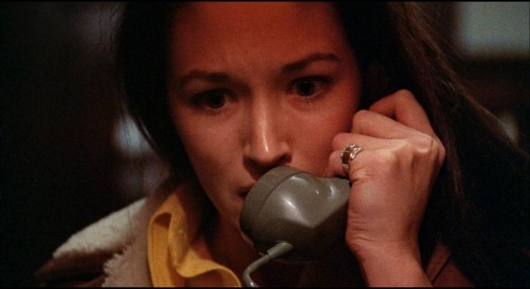 At a Christmas party at the Pi Kappa Sigma house, Jess Bradford (Olivia Hussey) receives an obscene phone call from “The Moaner,” a disturbed individual who has been calling the house. Jess and her sorority sisters Barb (Margot Kidder), Phyllis (Andrea Martin), and Clare (Lynne Griffin) listen in on the call. The feisty Barb provokes the caller, who responds by telling the girls that he is going to kill them. It’s the standard opening to a low-budget ’80s slasher flick: Two college kids (Carol Capka and Shannon Norfleet) are making out in a convertible. While things are gettin’ hot and heavy, a burly lunatic jumps on top of the car, slices through the soft-top and stabs them to death. Meanwhile, at Lanier College, it’s finals week. As the semester comes to a close, a fraternity plays a prank by staging a phony school shooting/terrorist attack. I know what you’re saying, “A terrorist attack! ?” Yes, a goddamn terrorist attack. I’m talking ski masks, machine guns, a black van – the whole nine. Only in the ’80s could a silly slasher flick draw on real-life events like the U.S. embassy hostage situation in Tehran and President Reagan’s feud with Libya’s Muammar el-Qaddafi for a punchline. Anyway, an escalating series of pranks and hazings distract everyone – including the town sheriff (Sam Kilman) – from the presence of a lumbering, knife-wielding psychopath intent on slashing up a few student bodies. That’s pretty much all there is to Final Exam, a forgettable film written and directed by Jimmy Huston (My Best Friend Is a Vampire).